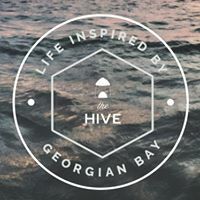 Our Coast to Coast collection is now at the Hive at Georgian Bay. The top spot to find beautiful objects and clothing inspired by summers spent on the Bay. Pop into their beautiful new shop for clothing and homewares to outfit you and where ever you call home and stay for a bite to eat at the cafe and dock yoga. The Hive is accessible by land and water!